Imaginary Journey presents images, films and sounds of two different situations – a suburban high street and a local park with the central panel of black and white photographs being images taken whilst making the journey from one location to the other. A series of questions within the work ask you to describe how you might take this journey, with a question on each panel as you travel horizontally across the work. The first panel asks you to imagine starting a journey from this place, to imagine a person you would like to meet and on to more predictive ideas around imagining how this destination could change your future. 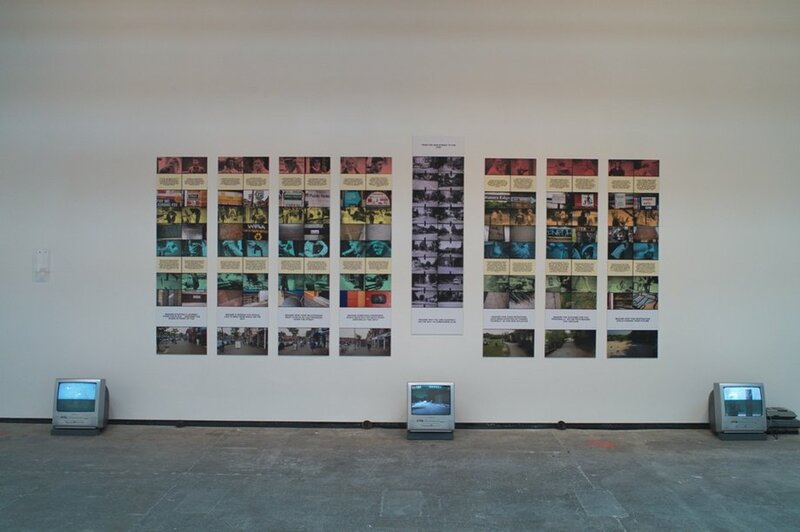 In line with Willats’ ideas about authorship in the making of a work, Imaginary Journey involved a group of people in the documentation of the two locations – each person recording one element of the environment, such as sounds or surfaces, which are then presented as the horizontal elements in the work with the vertical columns reflecting a particular point on the journey. Reflecting Willats’ continuing interest in defining the relationship of the audience to his work, not just as passive viewers, but as active participants, each participant has their own copy of a Guide Book to record their own Imaginary Journey as they look at the work. Imagination is a highly relative, personal and active state of mind. Imaginary Journey invites you to project yourself into the reality it represents, one that symbolises the very normality within contemporary life, and to create a relationship with someone else that you might envisage meeting within that symbolic world. It asks you to speculate on what is happening to you as you switch between two quite different locations, creating an interplay between the encoded fragments of reality presented in the work, and the associations and transformations it creates in your mind as you project yourself into this symbolic situation. The two locations are from a familiar suburban world and consequently, they are intended to be accessible and open to many different interpretations. You can choose from the fragments of encoded experience and information represented to you to create your own sense and order as you imagine your own journey between the two places. How you interpret the eight questions that form the sequence presented in the work is entirely up to you, as there is no correct response and will be different for each individual. This guide is a vehicle for you to articulate and externalise your responses to the sequence of questions, and to imagine yourself within the depicted Symbolic World. Using the space below each question, make a note of your thoughts, and keep this guide to the work as an aid to recollecting your experience.